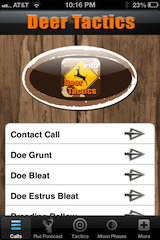 Deer Tactics & Calls is packed with features to improve your deer hunting success. 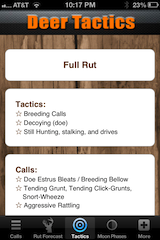 For each deer call, Deer Tactics provides you with tips on how and when to use each call. 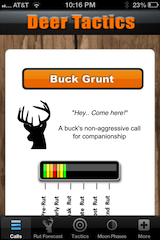 Use your app in the field to call in your trophy buck, or listen to the calls to practice your calling technique. 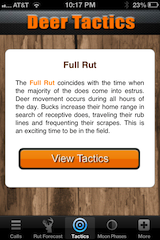 With Deer Tactics thorough description of each Rut Phase, you’ll have a better understanding of what is happening biologically within the deer herd in your area at any given time, thus allowing you to employ hunting techniques and tactic to maximize your success. 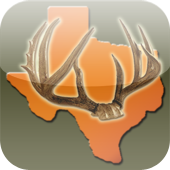 Deer Tactics also provides you with a lunar calendar aso you can plan your hunts on days that are most likely to be productive. 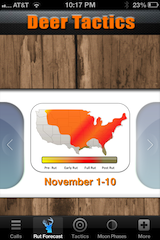 If you are looking for location-specific solunar feeding periods, sunrise/sunset times, and moonrise/moonset times, please consider downloading our other app – iSolunar Hunting & Fishing Times. Based on John Alden Knight’s original Solunar Theory, deer are most active around a Full Moon or New Moon (4-star rating). This is when the gravitational forces of the sun and moon exert their strongest influence. 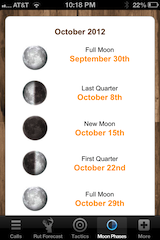 Around the first and last quarter moons (1-star rating), the gravitational forces are the weakest and deer activity is less intense.